← New to Twilight Struggle? Not much of a concern, since even in the Late War 3 Ops is probably better than 1 VP. It’s best if played at the end of the turn, but if you can’t manage that it’s not a huge deal. This event is only irritating in the sense that all of the US +1 VP cards tend to show up right as you’re trying to win by Wargames. Not a good event, unless you hold a lot of “war” cards and desperately need to cancel Flower Power, or if that 1 VP matters for Wargames / autovictory / The Reformer. 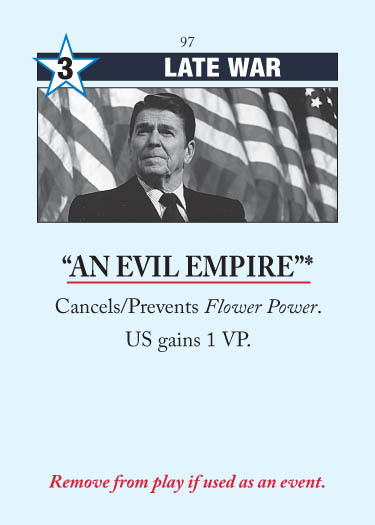 This entry was posted in Late War, US Events and tagged An Evil Empire. Bookmark the permalink.